The recent detection of a gravitational wave from a binary neutron star by the LIGO/VIRGO collaboration was followed by observation with space and ground-based telescopes in addition to neutrinos and cosmic-ray detectors, opening the new era of exploring the Universe through all its known messengers. The observations involved thousands of scientists from different instruments and backgrounds: high energy space and ground-based instruments and neutrino detectors observed simultaneously to optical and radio telescopes. The electromagnetic counterpart of the gravitational waves created by this merger produced a kilonova, a transient phenomenon that was successfully observed from gamma rays to radio and its afterglow may be still detected at very high resolution with VLBI. Many astrophysical phenomena, such as transient event, can now be observed through different messengers giving us the opportunity to obtain a more complete picture of their enigmatic emission mechanisms. 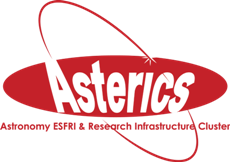 Goal of ASTERICS is to bring together astronomers and (astro)particle physicists to cooperate on technological progress and common challenges of multi-messenger science. After receiving an alert, researchers can use the full capabilities of the LOFAR array. They search for bright, low frequency radio flashes from transients such as neutron star mergers and fast radio bursts. In multi-messenger astrophysics, multiple facilities observe target objects using different messengers and wavelengths to obtain a more comprehensive picture of events. It is important to schedule the observations carefully. A team of developers worked closely together with end users in a Scrum framework to develop software that allows the LOw Frequency ARray (LOFAR) telescope to respond rapidly to external triggers from other instruments. The LOw Frequency ARray (LOFAR) is a next generation, low-frequency radio telescope that is fully controllable via computers and has no moving parts. This makes LOFAR an ideal facility to rapidly respond to new transient events. A meeting of international researchers to review recent scientific and technological progress, and to continue planning the future of multi-messenger astrophysics. The goal of the ASTERICS Policy Forum (APF) is to study how to harmonize joint and efficient scheduling, operation and interoperability of the various Multi-Wave length/Multi-Messenger telescopes.